Metasepia Pfefferi, or Pfeffer's flamboyant cuttlefish, is truly one of the most amazing creatures on the planet. First, its a cuttlefish, which makes it pretty awesome to begin with. Not really fish at all, cuttlefish are actually part of a stellar group that includes the squid, octopus and nautilus. Cuttlefish are, in my humble opinion, the rock stars of the cephalopod world. They are simply magical. Their skin can literally turn any color or pattern in a blink of an eye, thanks to a powerfully complex nervous system that gives them complete conscious control over each cell. They can even alter the texture of their skin, raising ridges and bumps or going smooth as glass depending on their needs. And let's not forget their wonderful eyes, highly developed and powerful organs with w shaped pupils that would outperform our own. This strong visual acuity, coupled with a powerful brain and tentacles that are as dexterous as a human hand, has led to the most wonderful thing about cuttlefish of all. They are geniuses. Seriously, their minds are a complex domain that science is only starting to explore. Okay, perhaps after all this cuttlefish talk you're starting to wonder why the flamboyant cuttlefish deserve special attention. There are two reasons, really. 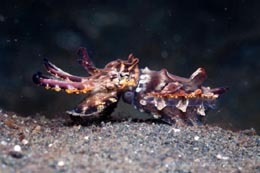 First, they are the only poisonous cuttlefish, and one of only three poisonous cephalopods. Their muscle tissue contains a highly potent and rare toxin that science still doesn't fully understand. Those bright colors that make this guy so flamboyant are a statement to the world. "Don't eat me, or you will die." The second, and I think far more exciting, thing that makes these marvelous creatures so special is their size. All that amazing brain power is contained in an animal that would fit comfortably in a shot glass. Seriously, a five inch long flamboyant cuttlefish would be a monster. They're more often around three inches. This simple fact destroys our prejudiced assumption that a huge brain is required for a high degree of intelligence. Please, don't take my word for it. Watch the video below. Ignore the narrator, and instead look into the tiny cuttlefish's eyes. Watch as he shifts from hunting camouflage to flamboyant threat display. Watch how he takes in his surroundings and tell me there isn't a sharp mind buried in that tiny boneless body. Please comment below. I'm curious to see if I'm the only one who sees this. No you are not the only one. Sadly acidification of the ocean may cause this jewel to go extinct. Wow! So cool! I wished I had one of these in my private aquarium (Actually, I don't have a private aquarium)! 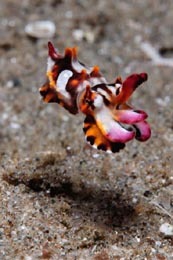 Wonderful post about the flamboyant cuttlefish. Thanks!